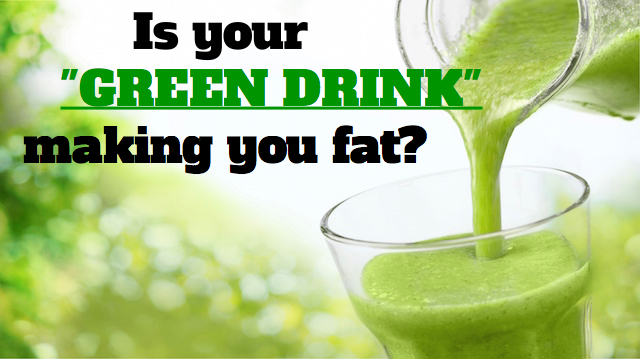 Hidden Dangers of Your "Green Drink" — Is It Making You Fat? Hidden Dangers of Your “Green Drink” — Is It Making You Fat? Green smoothies are like the new Jazzercise — everyone is jumping on the bandwagon. They are touted as the health conscious person’s holy grail. To get more servings of important fruits and vegetables, you’ve just got to drink green smoothies! But what if that healthy-looking drink is actually nutritionally similar to an ice-cream sundae? This could be the case with many popular store-bought brands, juice bar drinks, and even homemade recipes. It’s vital to develop a keen ability to weigh up healthy ingredients versus those that can negatively affect metabolism, energy levels and body weight. Sometimes it’s a fine line, but we’ve examined the issue to help you decode those menus, ingredients lists and recipes. Here’s how to ensure your green drink is really delivering the benefits you think it is. Is your smoothie full of sugar? Sugar is the most common and also the most harmful thing hiding in your green drink. Even if the ingredients read something like “apple, pineapple, carrot, kale,” it’s likely that the fruits are weighted much more heavily than the vegetables. This can add up to a whopping 50 grams of sugar or more! Particularly look out for any added sugars like agave nectar or fruit concentrates. When we consume fruit that has been processed this way, we miss out on the fiber that helps balance the naturally occurring sugars. Unfortunately, fructose without its partnering fiber goes straight to the liver, where it incites a process that results in fat storage. We consume green smoothies to bolster our diet with nutritionally rich fruits and vegetables and to avoid the ill effects of processed foods. Drinking a smoothie that is high in sugar can actually have the opposite effect. A smoothie high in sugar can cause the same energy spikes and drops as a powdered donut! These sugar highs and the resultant stress on the liver and hormonal system can cause metabolic derangement over time. This means that drinking a sugary smoothie every morning could result in a breakdown of the body’s mechanisms, which are necessary to keep energy burning and fat storage in check. Regular sugar consumption can cause insulin resistance. This occurs when the cells are no longer sensitive to insulin, which is required to use sugar as energy. Leptin resistance can also occur, which can make us feel constantly hungry and foster the storage of excess body fat. This is why it’s so important to avoid smoothies and juices with ingredient lists that start with cheap, sugar-rich juices like apple, orange or pear. These fruits are plentiful and their juices are basically fillers to bulk up the product. They are often used in place of more expensive ingredients, like spirulina or pomegranate juice. Look for ready-made products where the first few ingredients are vegetables. Or better yet, make your own smoothie or juice with mostly low-sugar, high-nutrient veggies and fruits like spinach, cucumber, celery, lime, parsley, green apples, avocado or blueberries. While a sweet taste definitely makes a veggie-rich smoothie more palatable, it’s important not to replace sugar with other sweeteners. We certainly want to avoid any artificial sweeteners like sucralose or aspartame, which have detrimental effects on the gut and brain. Even stevia is often processed. Studies have shown that processed stevia can affect hormones and fertility. So-called “natural” sweeteners like rice syrup, corn syrup, cane juice or agave nectar can make you think you’re in the clear, but in fact they deliver quite the glycemic punch. Be on the lookout for any sweetening additives in products that you purchase, and stick with a small amount of fruit or raw honey in your own concoctions. Coconut milk is another great ingredient to add a touch of sweetness without much sugar. What is thickening that smoothie? Many smoothies and juices are made with thickening agents to give the product a creamy texture and a satisfying mouthfeel. The addition of dairy products can pose a problem for people who are lactose intolerant. Pseudo-food ingredients like guar gum, bean gums or carrageenan are also added to improve the texture of store-bought smoothies. We recommend using creamy ingredients like coconut milk or chia seeds to thicken the smoothies you make at home. Using frozen produce (rather than fresh from the fridge) can also add texture and weight to smoothies. In addition to depriving the body of calories, it’s possible that smoothies don’t provide as much nutrition as we think they do. Many vitamins must be consumed with fat in order to be used by the body, but most smoothies and juices are made up of only fruits and veggies. Be sure to mix some avocado, coconut oil or hemp oil into a smoothie to ensure that those fat-soluble nutrients get absorbed. If you don’t like the texture, simply eat a few spoonfuls of fat on the side. The fact that smoothies and juices are simply swallowed and require no chewing can also lead to problems. Teeth weren’t meant to tolerate that amount of acid, which could be damaging to enamel. Consuming calories without chewing can also reduce blood flow to the teeth and gums, which leaves them deprived of important nutrients and could lead to tooth decay. Finally, the high level of oxalates in the greens used in smoothies and juices can be a major concern. These are chemicals in raw leafy greens and cruciferous vegetables that can affect thyroid function and contribute to the development of crystallized stones in soft tissue. Don’t replace meals with smoothies — make sure you are eating some solid food, like a couple of boiled eggs or some cheese, along with the liquid. Stick with vegetable-rich recipes — limit fruit to less than a quarter of the total ingredients. Add healthy fats — make sure you mix in some coconut oil, hemp oil, or avocado to allow the absorption of all those nutrients. Don’t drink them on the daily — having a green smoothie a few times a week is probably enough. If you’re feeling a bit disillusioned with green smoothies, check out these awesome healthy habits to adopt instead! Hey Buddy!, I found this information for you: "Hidden Dangers of Your “Green Drink” — Is It Making You Fat?". Here is the website link: https://www.thealternativedaily.com/dangers-of-your-green-drink-making-you-fat/. Thank you.